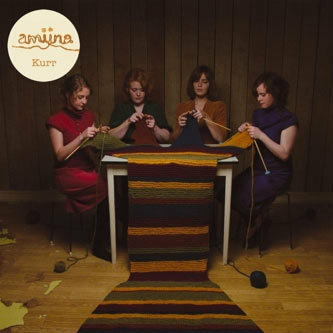 Icelandic all-female ensemble Amiina have certainly come a long way since their origins at the Reykjavik College of Music some 15 years ago. At the time the group were a mere string quartet, playing other people's music in an academic environment. All that was set to change once Sigur Ros collared them for some assistance with string arrangements and tour support duties. You might say that a good proportion of Sigur Ros' sound post-Ágætis Byrjun has been directly informed by Amiina's contributions to their sound - you could hear a great deal of common ground between their work on the epic ( ) album and the kind of languorous, romantic strings on their debut AnimminA EP. That sort of effortlessly vast sound still rears its head on this debut album, and by the time you get to 'Glamur', you feel as though Jonsi Birgisson's falsetto could come crashing in at any moment, but of course it never does, and as the album progresses you can hear Amiina slowly getting further and further away from their old ties, gradually and organically finding their own sonic identity. The willowy bowed saw and synthesizer tones of 'Seoul' give the first hints at the band's broadened range of instruments, and on 'Hilli' you can hear a very folksy approach to composition, with the ladies adding their voices to the mix in a beautiful, choral fashion. However, it would be a crime for Amiina not to give their string quartet background a fair representation, and sure enough, on tracks like the majestic 'Sexfaldur' they deliver the goods in spades. 'Lori' is similarly stately sounding, but features some drums, played in a militaristic, almost marching rhythm while a shimmering harpsichord flutters along in an accordingly formal, baroque manner. One of the biggest surprises here comes from 'Blafeldur', an immeasurably graceful piece for brass. There's something wonderfully morose about it that seems to condense all the most successful elements of Amiina's boundlessly elegant music into a brief three minutes. Totally essential stuff and a massive recommendation.